In order to fully understand the benefits of using Dryzone damp-proofing cream it is necessary to examine the shortcomings of the traditional “pressure injection” and “gravity-feed” damp-proofing systems that have been used since the 1950s. Damp-proofing fluid can flow through cracks and fissures in the mortar, rather than spreading evenly through the mortar. This can lead to problems with fluid flowing through party walls and causing damage to neighbouring properties. Large quantities of water or solvent are introduced into the wall, prolonging the drying-out process. Most damp-proofing fluids contain approximately 95% water or solvent. Pressurised injection creates a health and safety risk. Unless an adequate seal is created, fluid can “blow back” into the operative’s face. Each wall is different in porosity, and, hence responds differently to pressure injection. Operators do not always adjust their technique to take this into account. Expensive electric pumps, which require regular maintenance are required for pressure injection. The pressure injection process is boring, uncomfortable, slow, and highly operator dependent. Less dedicated operatives may inject for a shorter time than required, leading to quality control problems. The gravity feed system is very time consuming as “funnels” usually have to be filled several times to provide an adequate level of treatment – particularly when large-dimension walls are being treated. Many damp-proofing fluids used in gravity feed and pressure injection damp proofing systems are corrosive or flammable. Dryzone is not injected under pressure. It is simply introduced into holes in the wall and allowed to diffuse. This eliminates the problems listed above caused by pressurised injection. Dryzone contains over 60% active ingredients, compared with approximately 5% for damp-proofing fluids. Therefore a much smaller amount of water is introduced into the wall, reducing the drying out period. 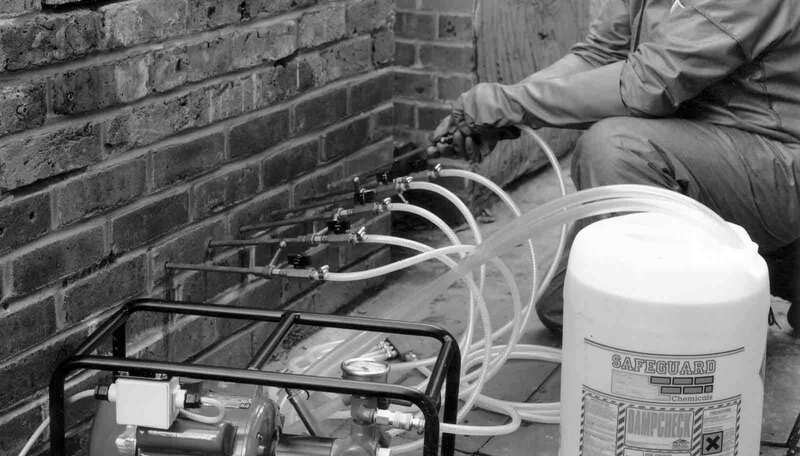 Dryzone is installed using a simple applicator gun that costs a fraction of the price of an electric damp-proofing pump. 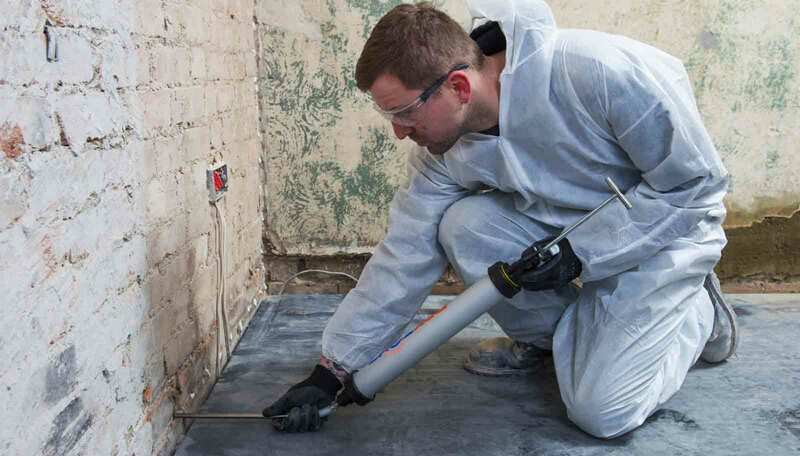 Dryzone is able to offer benefits to the damp-proofing contractor over and above merely overcoming the limitations of traditional pressure injection. The most important of these benefits is speed of application. Typically, a replacement damp-proof course can be installed three times more quickly when using Dryzone than when using chemical injection. On large-dimensioned walls, Dryzone is also considerably faster to install than gravity feed systems. By using Dryzone, a damp-proofing contractor is therefore able to fit in more jobs every week, thus improving profitability. Consistent Application Rate - Dryzone makes pricing for jobs easy. It is easy to estimate how much material will be used as there will be no “fluid loss” through cracks and fissures in the wall. Low Hazard – Dryzone is non-caustic, non-flammable, and is not injected under pressure – making it much easier to comply with health & safety regulations. The fact that Dryzone can be installed much more quickly than pressure injection treatments means that disruption to the occupier is minimised. Where rented accommodation is concerned, the owner would normally have to pay for alternative occupation for the occupier if the work continued for more than a day. Using Dryzone, treatments that would normally take two days to complete can be completed in under a day, saving the owner or housing association large sums of money in hotel bills. Dryzone’s solvent-free formulation eliminates the odour problems associated with some traditional damp-proofing treatments. Health & Safety considerations were high on the list of development criteria for Dryzone. For this reason, Dryzone was formulated to be non-toxic, non-caustic and non-flammable. The Dryzone development team were committed to ensuring that Dryzone had a minimal environmental footprint. In addition to Dryzone’s highly concentrated but low toxicity formulation, a novel foil packaging system was used. Because of Dryzone’s concentrated formulation, transport costs and associated emissions can be greatly reduced. As can be seen from the table above, a much smaller weight of Dryzone is required to treat a given section of wall than is the case with traditional damp-proofing treatments.